We’re back to baking Harry Potter treats! I can never stay away too long from all the amazing food mentioned in all the books. So I thought we’d start with treacle tart, a personal favourite of Harry’s. In fact, it’s so much of a favourite, it’s one of the scents in Amortenia when he smells it. Now, everyone is going to love how easy it is to make this dessert. If you’re using premade pie crust, it’s only another three ingredients that make the filling. And if you have a super sweet tooth, this tart is going to rock your little socks off. If you aren’t a fan of super sweet, still give it a shot so you can say you’ve had Harry’s favourite treat. Like all the other food in Harry Potter, treacle tart is a very traditional British food. From what I can tell, because of it’s age, the recipe has probably changed over time, since the recipe’s been around since before golden syrup was invented. However this is the most common version most will have been brought up with, although there are multiple recipes that use the beautifully dark treacle, or even do a half half mix. 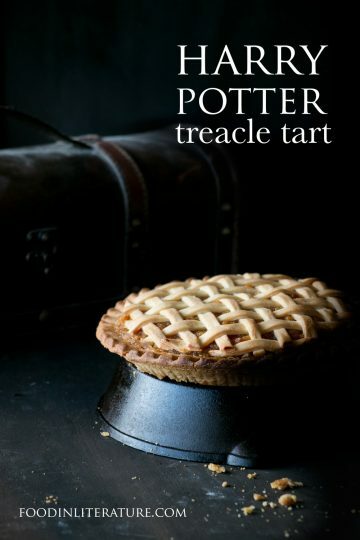 Not surprisingly, because of how British treacle tart is, you’ll also find it in many other books (and movies and tv shows). So even if you aren’t from the UK, you’ll have heard it. Here’s a sample of the different places it’s shown up. The childcatcher in the movie Chitty Chitty Bang Bang shouts “Treacle tart! All free today!”. In Alice in Wonderland: “What are tarts made of?” “Pepper, mostly,” said the cook. “Treacle,” said a sleepy voice behind her. In a medium saucepan, warm up the golden syrup until it's runny. Add the bread crumbs, lemon zest and lemon juice, and stir it all together. Pour it into the pie crust. Cut the dough into long strips for the lattice top. Place onto the top of the pie and cut the excess off. Bake for 35 minutes until the crust is golden brown. 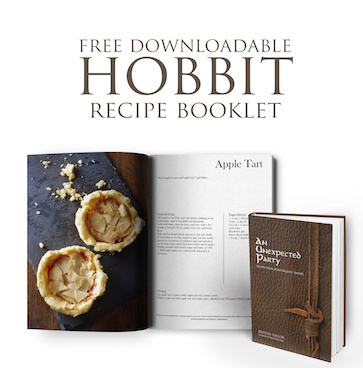 Recipe adapted from The Unofficial Harry Potter Cookbook and plenty of online research. Should be served warm with ice cream, clotted cream or custard. Just because it sounds like a syrup tart for you, it doesn’t mean the recipe deserves only one star. It is a delicious recipe, I have made it myself several times.